I've been waiting since 9th April for my Avant and recently got a build date of 03/12/18. Today, the dealer has cone back to me to say that adding this option will lose me my build date and put me back on the wait list. Can anyone with the storage pack comment on how useful this option really is, in an Avant? The storage pack won't give you the load-liner that stopped the Aldi milk becoming a complete disaster - that's still a £90 accessory from Audi. I have the Storage pack in my RS4 and an Ebay loadliner from Poland for £30 - which is arguably better quality being grippy rubber... The storage pack gets you various nets, behind the front seats, either side of the luggage compartment plus elastic straps and an additional storage space below the light switch? If it's not big money then still worth having. If you have something like milk in a shopping bag I tend to put it to the side and use the little hooks to keep it upright. It's worked for me so far, but I don't know if the hooks are standard or part of the comfort pack. Me too - Gravity & Murphy's law are far to reliable to leave it to chance. Don't have storage pack on my Avant and it's the only option I really wish I had specced. Storage is a real problem in the S4, nowhere to put anything! DaveW, the storage pack is useful but not worth losing a long awaited build date for. You can retrofit the storage cubby under the headlight switch and creweaudi parts department have a set you can order. Nets on the back of the seats can't be added as far as I know but probably only useful if you regularly have passengers in there. The rear arm rest also has a small storage compartment and cupholders that I don't think come in the standard car. As for the boot, the side nets can be retrofitted or cheap velcro fix ones can be found online. There is also a 12v point, not sure if that is standard, but mine's never been used. The luggage net that fixes to the 4 tie points is handy and can also be bought separately. 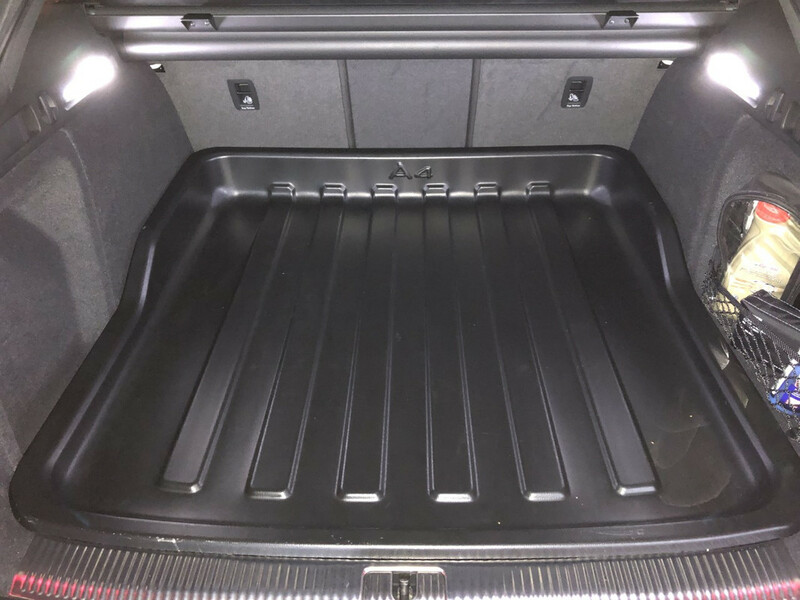 There is also a load divider between the boot and cabin - not sure if this is standard or part of the storage pack. If you look in the Audi A4 accessories brochure you'll also find a bunch of storage solutions that will do the job nicely (for a price). DaveW and cuke2u like this. Thanks for the answer, I told the dealer to leave the pack and your post has made me happy that I have. I very rarely have rear passengers so the seatback nets and arm rest would never be used. The main reason I was getting this was because of the luggage compartment nets. But I will get some aftermarket ones instead. jimssian and Jcbmally like this. It's gone up £2.50 since I bought mine about a week ago - now £32.99 with free carriage. Jcbmally and DaveW like this. Get it, it's worth waiting for. B9 is scarce on storage. I have 2 B9 Avants, one S4 with, the A4 Tdi without. I know what I'm talking about. My main worry is that I'm hoping to put pressure on the dealer for some sort of discount, because of the long wait. By losing my build slot for an optional extra, I'm contributing to that wait and I'm thinking it weakens my position. Does the storage pack also give you the second glove box to the right (uk) of the steering wheel? It gives you the storage box that #9 is referring too.. Received my one today. Excellent fit, very happy with it. Thanks for the find. I don’t have the storage pack either but have the small net on the right hand side indent. I find there’s plenty of space without the pack and opted not to spec it as have a full boot liner for the dogs fitted so no use for the large net, although I did keep mine from my previous S3 and fits perfect if ever needed. Also didn’t want the nets behind the seats as just a rubbish trap with the kids in the back! Then plenty of storage in glove box, arm rest and door bins. Only possible benefit is cup holders in rear armrest but wasn’t that bothered.